Small, light-pink, formal double flowers with the typical sasanqua scent are produced in abundance in October and November. An upright and dense habit with a tendency to spread. Dark green leaves. Can readily be kept clipped as a low bush and so is ideal for the smaller garden or as a container plant. As with all sasanquas, flowering is best when given a sunny sheltered growing position. Small, fragrant, light pink, formal double flowers in October/November. Upright growth habit. Prefers a sunny, sheltered position. A very pretty camellia which flowers when my others don't. [As late as December]. 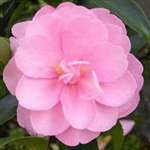 The Camellia was shipped quickly, securely and arrived in excellent condition.